The latest theory of Cosmology, ‘Cycles of Time’, as put forth by Roger Penrose and debated by others including Stephen Hawking who has written the magnum opus on Brief History of Time appears to be tantalizingly close to the Hindu Philosophy on Cosmology. The Hindu Philosophy is more like a pyramid that encompasses a wide ranging of thoughts and practices that represent many paths to God Realization. These are: Advaita Philosophy; Vishistadvaita Philosophy; Dvaita Philosophy; Samkhya Philosophy; Upanishads or Vedanta Veda; Brahmanas; Mimamsa; Shaivism; Vaishnavism; Raja Yoga, Gnana Yoga, Bhakti Yoga, Karma Yoga, Kriya Yoga, Patanjali Yoga, Vasishta Yoga, Tantra Yoga, Mantra Yoga. (i) The Renaissance of 15th and 16th centuries which led to an increased concern with the real world and a turning away from the scholastic theology. (ii) The invention of printing with movable type which made it possible for the books of scientists such as Copernicus and Galileo to circulate rapidly throughout Europe. “We have learned to keep questioning past ideas, formulate general principles on the basis of observation and experiment, and then to test these principles by further observing and experiment. In this way the modern physical science (and to an increasing extent, biological science as well) has been able to find mathematical laws of great generality and predictive power. These observations are well taken and are true in the sense that the ancient wisdom was based on ‘meditative processes and ‘pure reason’ and “not based on active manipulation of nature through experiments”. Science depends on the making of postulates that need to be verified by experiments or observations and in this process of validation of the postulates; the postulates undergo changes to bring the theory in line with the experiments and observations. But what needs to be acknowledged is the fact that in the Hindu Philosophy, the conclusions that were reached by following the path of reason was more from the plane of meditation on the origin and purpose of life rather than through experiments and manipulation of the data. What is startling is that these conclusions that were arrived at through the path of ‘pure reason’ are provocatively close to the modern theories that are based on mathematical laws and verifiable physical parameters. The Bharatiya Knowledge System was based on meditative process and pure reason which philosophical statement of Hindu Dharma, “Tat Twam Asi”, which translates to “You are That”. Whereas science is based on active manipulation of nature through experiments. Science depends on the making of postulates that need to be verified by experiments or observations and in this process of validation of the postulates, the postulates undergo changes to bring the theory in line with the experiments and observations. What is startling is that Hindu Knowledge Systems arrived at conclusions that are tantalizingly close to the modern theories that are based on mathematical laws and verifiable physical parameters. For the first time, Theoretical Physics and the Hindu Knowledge Systems seem to be converging in explaining the creation and dissolution of Cosmos. However, it needs to be placed on record that there are still a few questions that Roger Penrose’s Theory of Cycles of Time need to answer before it gets accepted by the scientific community. The theory of Cycles of Time postulates that the evolution and dissolution of cosmos is dependent on the interplay amongst three parameters: Energy, Density and Entropy. Samkhya philosophy had indicated that the evolution and dissolution of cosmos is dependent on the interplay amongst three gunas: Satwa, Rajo and Tamo ginas. For the first time, the physicist and the philosopher have agreed on the number of parameters that dictate the creation and destruction of Cosmos. (a) Into what is the Cosmos expanding? What is that in to which the Cosmos is expanding? (b) How long will the Cosmos expand? It is natural to expect that as the energy of the Big Bang gets dissipated, the expansion would slow down. What happens to the Cosmos when the expansion stops? This resulted in the discrediting of the Big Bang theory. But the interesting thing is that the Cosmic Background Radiation does exist and it left questions about its origin unanswered. Normally one finds books on Physics of Cosmology written by eminent scientists/ physicists like Albert Einstein, Stephan Hawking, Roger Penrose etc. Also there are a large number of books as Commentaries on Metaphysics/ Advaita/ Adi Sankara’s Saundarya lahari/ Kapila Vasudeva’s Samkhya Philosophy by a large number of philosophers like Hiriyanna, Radhakrishnan, Madam Blavatsky of Theosophical Society etc. (c) General reader who has a curiosity to know about Creation and End of Universe/ Cosmos. It is necessary to place on record that the terms that are used in Hindu Philosophy and Modern Physics/ Science are all different. But the process and the concepts are identical making the Hindu Philosophy a religion/ philosophy with a scientific grounding. A large number of Physicists have been fascinated by Lord Siva, his dance and the little drum, dumru that he uses while dancing. The late scientist, Carl Sagan, in his book, Cosmos, asserts that the Dance of Nataraja (Tandava) signifies the cycle of evolution and destruction of the cosmic universe . It is the clearest image of the activity of God which any art or religion can boast of. Modern physics has shown that the rhythm of creation and destruction is not only manifest in the turn of the seasons and in the birth and death of all living creatures, but also the very essence of inorganic matter. 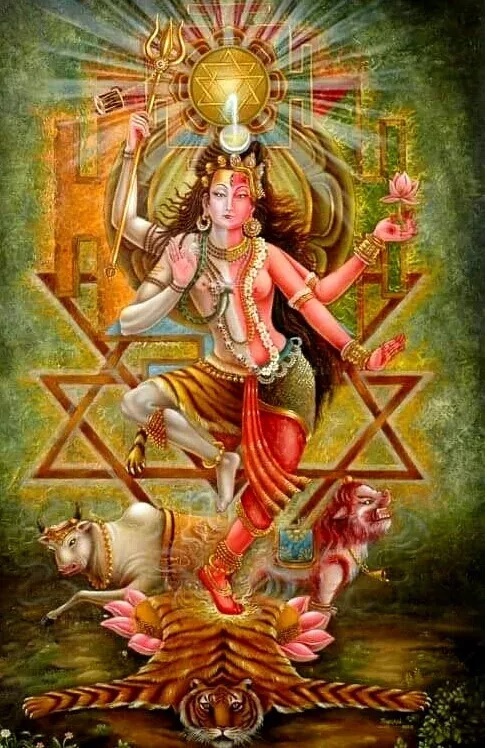 For modern physicists, then, Shiva’s dance is the dance of subatomic matter. Hundreds of years ago, Bharatiya artist created visual images of dancing Shiva‘s in a beautiful series of bronzes. Today, physicist has used the most advanced technology to portray the pattern of the cosmic dance. Thus, the metaphor of the cosmic dance unifies, ancient religious art and modern physics. Shiva’s dance is a symbol of the unity and rhythm of existence. The unending, dynamic process of creation and destruction is expressed in the energetic posture of Shiva. He dances in a ring of fire that refers to the life-death process of the universe. Everything is subject to continual change, as energy constantly assumes new forms in the “play” (lila) of creation, except the god himself whose dance is immutable and absolute. The pictorial allegory of Nataraja, the dancing Shiva, indicates the so-called “five acts” of the deity: the creation of the universe, its sustenance in space, its final dissolution at the end of the cycle of four world ages (yugas), the concealment of the nature of the godhead, and the bestowal of true knowledge. “Modern physics has thus revealed that every subatomic particle not only performs an energy dance, but also is an energy dance; a pulsating process of creation and destruction. The dance of Shiva is the dancing universe, the ceaseless flow of energy going through an infinite variety of patterns that melt into one another”. In Hindu mythology, it is a continual dance of creation and destruction involving the whole cosmos; this is the basis of all existence and of all natural phenomenon. In our times, physicists have used the most advanced technology to portray the patterns of the cosmic dance. Hindu Dharma uses symbolism and metaphor to present the various concepts that have been unraveled through meditation and therefore, to the modern observer who is educated in the use of modern scientific phraseology would find the explanations given in the Hindu Scriptures as prattling of nonsense. How did the universe get created? Will the Universe finally end in a fizzle and go silent? When will the Universe come to an end? In Hindu Dharma, all these are addressed with very clear date or time lines which span from the infinitesimal “truti” lasting 1/1,000,0000 of a second to a “mahamantavara” of 311 trillion years, which has been a matter of wonder for the modern cosmologists. But the Rationalists of today appear to believe that the age old practices are irrational and based on blind faith/ dogma and therefore, are irrational. The attempt that is being made here is to present such practices and thoughts as documented in the scriptures which are in a metaphoric manner which are not in consonance with the modern day scientific terminology and make a comparison with the modern day scientific explanation/ terminologies to show that those thoughts were after all not a case of prattling of nonsense as has been made out by the rationalists. At every stage the Hindu thinkers, gurus, philosophers sitting in their hermitages have been establishing the linkages between the cosmos and the internal being. Be it the Big Bang Theory and the consequent Background Radiation, the ancient Bharatiya thinkers had put these in a manner that made it amply clear that what exists outside of the being also exists inside the being and therefore, comes the famous Hindu philosophical statement “So Ham” or “Tat Tvam Asi” which means identifying oneself with the universe or ultimate reality or internalizing the external world. The Bharatiya astronomers went even further, giving a physical reason for how the dual star or binary motion might allow the rise and fall of human consciousness to occur. They said that the Sun (with the Earth and other planets) traveled along its set orbital path with its companion star, it would cyclically move close to, then away from, a point in space referred to as Vishnu-nabhi, a supposed magnetic center or “grand center”. They implied that being close to this region caused subtle changes in human consciousness that brought about the Golden Age, and conversely, our separation from it resulted in an age of great darkness, the Kali Yuga or Dark Age. When the Sun in its revolution around its dual comes to the place nearest to this grand center, (an event which takes place when the autumnal equinox comes to the first point of Aries), dharma, the mental virtue, becomes so much developed that man can easily comprehend all, even the mysteries of the Spirit. The word dharma refers to the way of living in harmony with nature and not to any specific Godhead. This is the reason why the Veda has hymns that pay obeisance to nature, the well being of which is necessary and mandatory for life to exist and thrive. These salutations to mother nature made many intellectuals and rationalists call Rig Vedic chants, a prattling of nonsense. It is only now that the modern scientist has discovered the importance of protecting nature, a very late realization which is due to the fact that there is an order of magnitude difference in the time cycles (of response) of man and nature, which gives a false impression of man being in control of everything. Take the latest fad on “Past Life Regression”. This is nothing but a certification and justification of re-incarnation of life. This once again shows that the Bharatiya sages sitting in caves and hermitages, closing their eyes and meditating upon life and cosmos came to the same conclusion as have the scientists and psychologists of modern day. Thus, Hindu Dharma is definitely a religion that has a very sound scientific grounding and base unlike other religions who believe that there is only one life or who believed that earth is flat and sun revolved around it. In what Penrose calls “conformal cyclic cosmology”, the beginning and the end of the universe are in effect the same, since these two phases of its evolution contain only mass-less particles. Between now and a far off distant future, everything from the tiniest particles to biggest galaxies will have been eaten by black holes. They, in turn, lose energy in the form of mass-less particles and slowly disappear. As one black hole after another vanishes the universe loses “information”. Since information is linked to entropy, the entropy of the universe decreases with the demise of each black hole. Again from the 2nd and 3rd Law of Thermodynamics, Entropy and temperature can never become zero. Therefore, even at the time of dissolution, all most all of entropy and therefore information is lost, but still some information remains as Entropy does not reach a value of zero. In the words of Penrose, most of the memory of earlier existence is gone and the creation process starts after a certain time which is again decided by the interaction amongst the three parameters Entropy (which has remained), Energy and Density. Further, the Second Law of Thermodynamics implies that Entropy as a parameter can never be reduced to zero. The Third Law of Thermodynamics states that the entropy of a system approaches a constant value as the temperature approaches zero. This also means that one cannot attain absolute zero temperature. This means that the Cosmos is irrevocably heading towards destruction at the rate or pace indicated by the rate or pace at which Entropy is increasing. Therefore, by the Second Law of Thermodynamics, we can only try to delay the destruction by trying to reduce the rate at which the Entropy is increasing. In the Hindu metaphysics, Kapila Vasudeva, who is looked upon as an incarnation of Lord Vishnu, and the founder of the Samkhya School of Philosophy, had said that the evolution and devolution/ destruction of Universe/ Cosmos is dependent on the interplay amongst three Gunas, namely, Saattva Guna: pure, brightness, Rajas Guna: action, change, mutation, passion, excitement, birth, generation, activity and Tamas Guna: Tamas is a force which promotes darkness, dissolution ,death, destruction, ignorance, sloth, indifferent and resistance, darkness. But before taking up this exercise, let us understand the difference between Samskruta, anglicized as Sanskrit, and English. Sanskrit adopts the principle of Object Orientation and therefore, a word has a contextual meaning and not a fixed meaning as in English. In fact this aspect of the Sanskrit language has been targeted by some writers and academics, who show that the Hindu religious masters do not adhere to a single representation and keep changing the goal posts depending on circumstances. Samkhya philosophy goes one step further than Sir Roger Penrose because it equates the Cosmos with in an individual and Cosmos outside the individual as both are governed by the same law. Thus, the theory of relativity was nothing new to our ancient sages who could, through meditation, unravel the mystery of Cosmos, both external and internal: Tat Tvam Asi. Adi Sankara, in Saundarya Lahari, has composed 100 verses to describe the beauty of Goddess of Consciousness. Sankara attributes both the process of creation and the process of ending of cosmos to the desire of the Goddess of Consciousness without which Lord Siva remains inactive. It is Goddess of Supreme Consciousness who alone makes Lord Siva take part in both the creation and the destruction of cosmos. Goddess of Supreme Consciousness is also called Sakti/ Paraasakti, who is the power behind all creation and dissolution of cosmos. The male half stands for Parabrahman/ Purusha and the female part stands for Prakriti. Therefore the union of these two results in the initiation of creation. Ardhanareeshwara symbolizes the harmonization of two conflicting ways of life. Sakti, the Supreme Goddess of Consciousness, alone can make Siva to take part in the creation process of cosmos. Hindu Knowledge System has been known world over for its study of consciousness in great detail. There are many divisions of consciousness. There are fourteen planes of consciousness which are divided into two groups, Adho Lokas or lower planes and Urdhva Lokas or higher planes. Earth, representing the physical consciousness, is the bottom of the Urdhva Lokas or higher planes. The Adho Lokas or the lower planes represent the subconscious. The seven Urdhva Lokas or higher planes are bhuh (earth), bhuvah (vital conscious), suvah (mind), mahah (pure idea or vijnana loka), janaah (bliss or ananda), tapah (penance or chit) and satyam (truth). Beyond vijnana loka, man starts transcending from personal to impersonal consciousness. In parallel, man is said to live in five sheaths of consciousness, which are called the pancha kosas. The outermost is the Annamaya Purusha, the physical man living in Annamaya kosa. Within it, sustaining it and sustained by it is Praanamaya Purusha, the vital man. Within it is Manomaya Purusha, the mental man or man living as a pure mind-being. Within it is Vijnanamaya Purusha, the man living in the world of pure idea. Within it is Anandamaya Purusha, the blissful-being. Within these five sheaths or kosas is said to live the eternal being, the Primal Purusha. By training oneself to looking inwards and transcending the outer sheaths of consciousness one can realize the eternal being. One of the reasons for some scientists believing that consciousness exists independently is because of the existence of observer effect as demonstrated in the case of light. The classic case of light existing both as particle and as wave shows that there is an objective – observable reality that exists whether we are looking at it or not. For example, there are tests that can be performed to shoe that light exists as particle. Also, there are tests that can be performed to show that light exists as wave. Therefore, measuring or testing what light is can defeat the purpose. Unfortunately, it has been proven that there is no test that can simultaneously test for both wave nature and particle nature, so in a way, light is whatever you want it to be. This goes back to the observer effect. By testing light, we make it whatever we want it to be either particle or wave. This raises an interesting question: what is light before we test it? Roger Penrose, based on the observer effect, theorized that the quantum events may cause the molecular structures in the brain to alter their state and trigger neurons in different ways. This theory of quantum process in the brain was, from the very beginning, criticized as infeasible as the brain was considered to be warm, wet and noisy and therefore not suitable for the delicate quantum processes to carry on in the brain. In the recent years research has shown the existence of quantum coherence in plant photosynthesis, bird navigation, the sense of smell in human beings and brain microtubules. Recent research shows that the microtubules in brain neurons help in selectively erasing consciousness while sparing non-conscious brain activities. Further, this erasing of the anesthesia only has a temporary influence on the microtubules as the erasing of the consciousness is only a temporary phenomenon. Microbiologists have begun to study the process of human evolution from a single cell organism into a complex functioning biological body. How the trillions of cells in a body interact with each other as a community has become the subject of scientific investigation. To some scientists, this brand of investigation is also known as “biology of consciousness”. For example, Dr. Bruce Lipton, a cell biologist in the medical field, cites his research to refute the idea that our personal disposition and diseases are genetically pre-programmed. Instead, he argues that our cell membranes, acting like a human receptor, can respond to the outer environment and send proper signal to our body to “prepare it”. We change our personal disposition, he argues, accordingly to the information our senses receive. Thus, the DNA mutation is not necessarily a random act; it can be triggered by our senses in response to interaction with the outside physical world. Because of the evidence of abrupt changes in various species, the Darwinian theory of gradual evolution over a vast span of time scale has proven to be a hoax. Our quick adaptability seems to be the underlying cause of our progress. Our ability to create an Oneness between the Soul and the physical world seems to be in line with the teaching of the Bhagavad Gita. The most scientific truth taught to the world by Hindu texts, Vedas are the sacred sounds and vibrations that control everything. The fact that the Beeja mantras, Brain waves and the waves of the planets have frequencies that fall in a band around 10 Hz, the brain waves get in sync with the waves of planets in deep yogic meditation. It happens when alpha and theta waves are perfectly balanced with reference to other waves across the entire brain, a communication is possible between the human being and the planet – connection is developed. Energy and information which are embedded in the Sunya or Zero point (Aether) is shared with the human brain. The planet communicates with us in this primal language of frequencies. The communication happens through the divine sound language that transcends through inter-dimensions and exists everywhere. The Hindu Knowledge System was once ridiculed for the practice of idol worship and also for the rituals that were performed. The Veda was called prattling of nonsense. Today, science has provided much evidence for all that is part of the Hindu Knowledge System. Not only that, many Gurus like Ramana Maharshi, Maharshi Mahesh Yogi, Paramahamsa Yogananda, Sri Sri Ravishankar, Jaggi Vasudeva and others through the popularizing and practice of Kriya Yoga involving breath control have made the practitioners reap the benefit of higher realization, proving that the teachings of Veda, Upanishad and Bhagavad Gita are eternal and help in elevating one’s consciousness and mind to greater levels, Thus the Vedic Concept and teachings are more relevant in today’s stressful life with conflicts and strife all around. Maharshi Mahesh Yogi was, in a way, encouraged the scientific investigations on the practitioners of Transcendental Meditation resulting in an unbelievably strong and voluminous scientific evidence of the influence and effect of meditation on the practitioners, irrespective of their initial conditioning related to race, religion, beliefs etc. This firmly established the fact that the Hindu Knowledge System was indeed the only religion and philosophy that had the scientific background which was verifiable and repeatable in any environment.